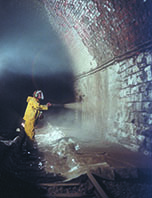 The use of spray concrete has steadily increased over the last two years given its fast application time and the number of projects it can be suitable for – from national infrastructure works to small-scale remedial repair. However, it’s traditionally been a product with some downsides which, if left unchecked, have the potential to add significant and unnecessary cost to any installation. Here, Duncan Haywood, Commercial Manager at Pozament – a Tarmac brand, discusses some of the common pitfalls associated with spray concrete application, and how the industry has started to address them. Without doubt, spray concrete is a real asset to the construction industry. It has led to sizable savings in installation time given its ability to facilitate large-scale concrete projects without formwork, and at high volumes. What’s more, it is the perfect solution for logistically-challenging situations such as tunnelling and bridge repair work, where traditional methods of applying concrete are not suitable. The integrity and longevity of any spray concrete project is determined by two key factors: the skill of the applicator and the performance of the product. Much has already been written about the technical ability and experience required to become a spray concrete applicator, and the development of the EFNARC Nozzleman Certification Scheme has gone a long way to ensure installation best-practice is commonplace across the industry. However, even the most skilled nozzleman is not able to combat certain installation issues if the product itself is at fault. When it comes to applying spray concrete, perhaps the biggest challenge for applicators is tackling the concrete rebound – sometime known as back-scatter – as it leaves the nozzle and comes into contact with the installation surface. Whilst the skill of the applicator will also determine the level of rebound to a certain extent, the product make-up is a huge factor. A small amount of rebound is necessary as it helps with the initial adhesive process of the concrete coming into contact with the desired surface; however, in some instances rebound can be as high as 20 per cent. Given the sheer size of some spray concrete projects, such as tunnelling or rail work on a national infrastructure project, 20 per cent wastage will quickly add up to a worryingly large material bill. A further potential product issue which applicators must be aware of is clogging within the spray gun hose. In a typical spray concrete application, a set blend of aggregate and cement is pumped from a hopper into the spray gun’s nozzle, where it is met with a fine spray of clean water which in turn hydrates the concrete and allows it to be applied. However, certain dry concrete mixes, despite complying to BS EN 14487, are actually more susceptible to causing blockages within the concrete gun or nozzle. If the aggregate-cement balance is not quite right then the mixture is more likely to adhere to the interior of the hose before it comes into contact with water. Overtime, this build-up will slow down the material flow and start to affect the pressure at which the concrete can be applied. Whilst this is another issue which is beyond the control of the applicator, in as much that it is not a human error and something which cannot be avoided by specific installation methods, ultimately persistent pump clogging will contribute to increased application time due to mechanical downtime. In order to ensure these application issues do not inhibit the continued growth of the spray concrete market, manufacturers are starting to develop high performance dry spray concrete blends which can contribute to both reducing rebound rates and equipment blockages. These new ranges of dry spray concrete products, such as Cemrok Dry Spray Concrete from Pozament, have b een re-engineered with optimised binders and also feature different aggregates which still comply with BS EN 14487. By tailoring the aggregate choice, applicators will have much greater control over the coarseness of the mix. This will in turn help to control and minimise the risk of material adhering to the interior of the spray gun hose and nozzle. Similarly, one of the key characteristics of high performance dry spray concretes is a much lower rebound rate compared to traditional blends which is achieved through the use of specific binders incorporated into the initial dry mix. Crucially, high performance dry spray concretes are still available in the varying strength classes (low, moderate, and high) as traditional products. As such, applicators can remain confident that despite the product design varying from what they may historically have been used to, they will still experience the familiar inherent strength characteristics associated with traditional spray concrete products. Ultimately, as has so often been the case within the construction industry in recent years, research and development has paved the way for new products to enter the marketplace which can solve product shortfalls. By embracing the wave of new high performance dry spray concrete ranges which have now become widely available, contractors and applicators can rid themselves of unnecessarily high material rebound rates and mechanical downtime during the installation process, yet still achieve the same levels of reliable product performance they are used to. Given the continued rise in demand for spray concrete jobs, and the savings on both material cost and installation time on offer, making the switch to high performance products should really be the next step for those serious about capitalising on market demand. Cemrok Dry Spray ConcreteA range of high performance pre-blended repair materials for spray application. Cemrok Wet Spray ConcreteA range of high performance pre-blended repair materials for wet spray application.